Until September 30, 2018: GreenheArt at the Nurseries Marino Favilla just outside of Lucca (Via Picciorana 262). A new art space in a nature setting has just opened to the public. 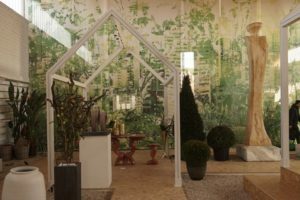 A greenhouse is now showcasing a series of contemporary art works: paintings by the artist Christian Balzano, sculptures of the Korean Choi Yook Sook, artistic glasswork by Bruno Pedrosa and Simone Crestani, and the photos of Riccardo Bagnoli. The intention behind GreenheArt is to foster an environment for the individual to enjoy a green space and contemporary art simultaneously, contributing to their well-being. The owners are open-minded about its use: it can be utilized for talks, dance, theater, yoga, performances and installations. For information about the space, visit www.vivaimarinofavilla.it or call 058 399 7598.